There's been a lot of buzz about Brooklyn's controversial Pacific Park development over the past few years, and now the 22-acre project's first condos have hit the market. 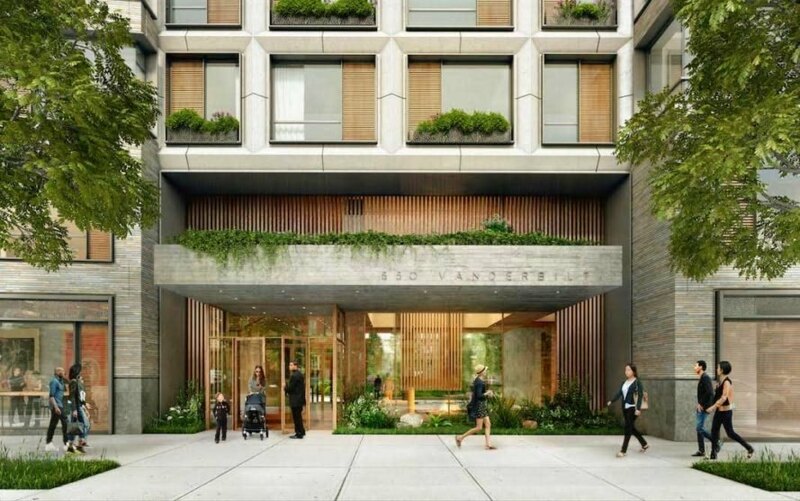 Designed by New York-based sustainable architecture firm COOKFOX Architects, 550 Vanderbilt Avenue is a 17-story residential building and the first of four condominiums planned for the Prospect Heights site. Once completed, the massive project will consist of 14 buildings all sharing eight acres of beautifully landscaped green space. Read on for a video of what living in one of these luxurious, park-facing homes might feel like. 550 Vanderbilt from Pacific Park Brooklyn on Vimeo. The sustainably-designed luxury condominium has 278 residences up for grabs ranging from studios to four-bedroom apartments and even some maisonettes and penthouses. Features include large windows and private terraces, and residents will also have access to an expansive landscaped roof terrace as well as a lounge with a fireplace, library, chef’s kitchen, children’s playroom, supermarket and of course, a fitness center. The building has minimal detailing in order to bring a warm, intimate quality to the overall project. Accordingly, all units have beautiful views of the shared park, designed by well-known landscape architecture firm Thomas Balsley Associates, in an effort to connect the interior living space with the community space. “We’re passionate about the idea that a healthy, resilient city depends on diversity and the highest quality housing and we believe that we’ve made that the heart and soul of 550,” said Cook. Construction on the Pacific Park Brooklyn development is slated to be completed in 2025. Upon completion, the massive new neighborhood will have 247,000 square feet of retail space, 336,000 square feet of commercial space, and a staggering 6,430 residential units with almost a third reserved for affordable housing. Residents will also have access to an expansive landscaped roof terrace as well as a residents' lounge with a fireplace, library, chefs' kitchen, children's playroom, supermarket and of course, the ubiquitous fitness center. The building has minimal detailing in order to bring a warm, intimate quality to the overall project. All units have beautiful views of the shared park in an effort to connect the interior living space with the community park, designed by well-known landscape architecture firm Thomas Balsley Associates. Construction on the Pacific Park Brooklyn development is slated to be completed in 2025. The Vanderbilt condos have 278 residences up for grabs, with numerous features such as large windows and private terraces. Upon completion, the massive new neighborhood will have 247,000 square feet of retail space, 336,000 square feet of commercial space, and a staggering 6,430 residential units with almost a third reserved for affordable housing.